How are you enjoying your autumn? The calendar says it's autumn, but I am still waiting for the "real" fall weather to set in. It has been much warmer than usual around here, and I am looking forward to it finally cooling off. For various reasons, I don't have money for decorating right now, so I am dreaming... (of course we can always bring some fall leaves in from outside, if it ever gets cool enough for them to turn!) Isn't the beauty of God's creation wonderful, and the changing of the seasons? What do you like to do to decorate for fall? I love candles, but I don't like how most of them use lead wicks and paraffin wax. Just do a little research and you'll see how unhealthy they are and what they put into the air when you light that innocent looking wick. There are some alternatives such as soy and beeswax candles, as long as they also do not have lead wicks, but they are more expensive and still melt like everything else, so you have to purchase them again. But there is even more available than these two options. 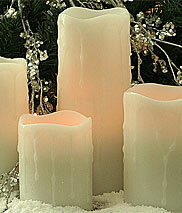 Another alternative to harmful lead wick/paraffin candles are LED candles. These do not have a real wick and won't melt, so they will last and last, making them a one-time "investment". I always thought LED candles would not be as beautiful as the "real thing". But after looking at several pictures and what is available, I don't think that anymore! Here is where to get LED candles. Battery Operated Candles offers a vast array of battery operated LED lights that are just beautiful, as you can tell from the pictures. Yes, those are all LED candles! Aren't they pretty? You can even get candles that are scented (or unscented if that's what you prefer). There are a variety of colors, as well as ones that look like they have wax dripping down the sides. I think those really look realistic. I hope this gives you some decorating ideas for fall and that you are enjoying this lovely season. 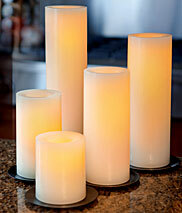 WARNING: LED candles are safer because they won't burn or start fires, BUT you must still be careful. LED candles are battery operated and the batteries are only a pill sized disc. Many children have managed to get these out of the candles and swallowed them. They can burn a childs esophegus or stomach in 15 minutes and cause death. There was a special on television about it a few months ago. Thanks for the info, Mrs. J. I guess then it's still a good idea to keep them out of reach, but wow, I've never had a child want to put a battery in their mouth!